“The British Pilgrimage Trust” (The BPT). Its objectives are to “advance education in and preserve the heritage and traditions of British pilgrimage”. In other words, we aim to restore pilgrimage to Britain in its best possible form, and to make it accessible to thousands more people. There is a boom in the number of people making pilgrimage globally. The BPT feels a duty to bring more of this pilgrimage ‘market’ to Britain, our ancient green and pleasant land. We want to encourage and guide this burgeoning return of pilgrimage, to help create a sustainable British pilgrimage infrastructure that might endure over a thousand years. At the Reformation, British pilgrimage disappeared. But like many ‘lost’ British traditions (bushcraft, knitting, baking etc.) pilgrimage has today re-awoken with new resonance for our modern land and lifestyles. The BPT aims to help this renaissance continue – and grow – into its best and most accessible form. – To help people – young and otherwise – learn discipline, courage, freedom and joy – and to rediscover their limits and needs, the beauty of nature, and their active place in history and society. We believe people can gain as much from three weeks of ‘proper’ pilgrimage as from six months of jet-setting global ‘travel’ – with a fraction of the ecological and economic cost. – To help British Churches overcome the current crisis of non-use, by restoring their active role in British life, to make them necessary spaces in the provision of pilgrim requirements – shelter, solace, prayer, historical information, song, water and electricity. – To re-invigorate village and small-town economies, turning depressed rural areas into thriving hubs of living community enterprise. – To encourage a health revolution. As a form of moderate exercise, pilgrimage is intense and continuous. Many studies link regular walking with lowered chances of acquiring nasty diseases. A walking nation is a healthy one. We are very proud to name Rupert Sheldrake as Patron of the BPT. Rupert is the renowned author of: A New Science of Life; The Science Delusion; and ‘Dogs That Know When Their Owners Are Coming Home. Rupert embraces and values the practice of British pilgrimage, and in lending our Charitable Trust his support, he is helping to ensure the best possible re-emergence of pilgrimage for modern Britain. Watch his lecture on Science and Spiritual Practises (clips starts at discussion of pilgrimage) HERE. – A re-appraisal of ‘How to Be a (proper) Pilgrim’ in book-form, to clarify the best possible methodology of pilgrimage, and to make this practise available to anyone, anywhere in the world, even those with as little as 1 hour to spare. – The launching of a dedicated British Pilgrimage Trust website, detailing routes and destinations all over Britain, offering technical guidance and support, reviewing pilgrim equipment and helping would-be pilgrims get on the path. – The exhibition of promotional pilgrimages, involving filming, talks and concerts. – The development of new takes on traditional pilgrimage routes. Re-plotting the Old Ways to cope with the modern twists – like motorways – that our ancestors did not face. Mapping these new routes on the website, and also on the ground. 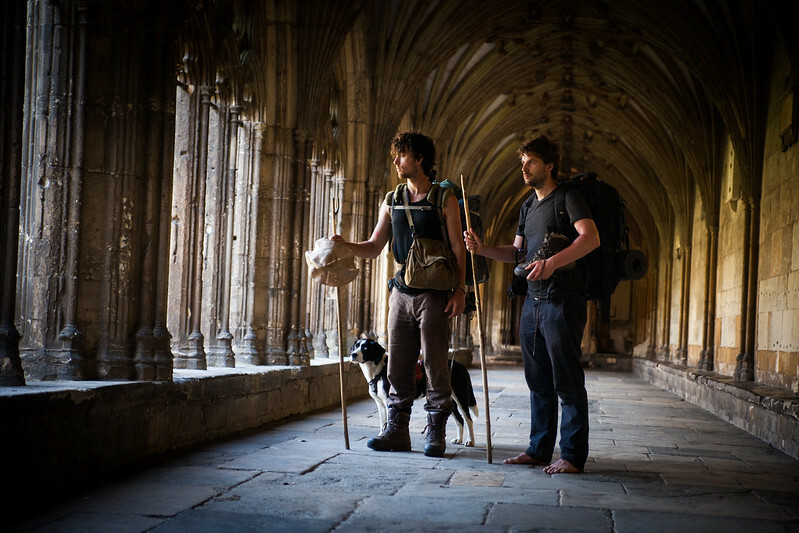 – The creation of an established pilgrimage circuit between Winchester and Canterbury – following the North AND the South Downs – to create a Great British ‘Camino’ that can rival the best pilgrimage routes of the world. We believe that if the Spain can do it, so can Britain. – The establishment of pilgrim hubs at Winchester and Canterbury, as administrative centres offering basic accomodation and equipment hire. – The creation of an infrastructure of ‘British Pilgrim Churches’ which are open (perpetually or upon request) to provide pilgrims with shelter and basic facilities. The more people using these great Temples of the British landscape, the more secure they will be, in both the short and long-term. – The foundation of a network of Pilgrims’ cold-harbours – wild-camping spots owned and administered by the BPT. These Pilgrims’ Acres shall remain perpetually in trust, to provide a non-commerical and ecologically impeccable accomodation infrastrucutre for British Pilgrims on the Way. – The increase of pilgrim numbers through targeted promotion and grass-roots marketing. – The creation of a sustainable growth model that can be re-applied in order to rejuvenate other British pilgrimage paths. If you want to see pilgrimage return to this land, in its best possible form for all the right reasons, please pledge your support today. Every little helps, but a lot helps loads. As with all charities, donations can only be spent on furthering our objectives. Phase 1 aims to create a beautiful website of stunning artwork and high-value information, a stable administrative base, a pilot trial of waymarking our new pilgrimage routes on the ground, and promotional drives through film and photography. Phase 1 requires funds of £7000. If you own land or businesses along the North or South Downs, and you are willing to offer pilgrims low-cost accomodation, please get in touch. Likewise, if you own or know of property around Winchester or Canterbury that could become a hub for the revival and restoration of British pilgrimage, please contact us. Together we can create an enduring Pilgrims’ Britain.